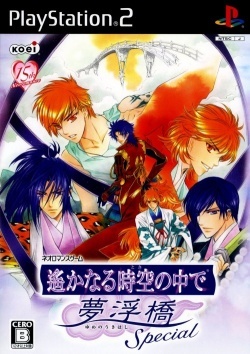 Game description: Harukanaru Toki no Naka de: Yume no Ukihashi is a crossover game of the first three Haruka entries. Sometime during the games' stories, the presiding god of the dream world is infuriated when an unprecedented vengeful spirit infestation threatens his realm. He abducts the souls of the dreaming three White Dragon Priestesses and their Eight Guardians —whose negligence he deems to be the main cause of the invasion— to demand their eternal servitude to him. They are rescued by the god's younger brother who offers his mansion as hospice. With his help, they seek to restore order to the dream world and rescue their captured comrades for a safe return to their rightful eras. The Special edition brings along new romance routes, new and additional voices, 24 save slots, and much more. This page was last edited on 16 April 2019, at 10:31.